Boy: “Mom, find me a race”. Me: I’m all over that. How about Mississauga? Net downhill. Gorgeous lake views and it puts us in Canada during hockey playoffs. He was in! I was pumped! “No worries, Kid, I’ll set you up when you’re ready. Me: I’m going to be in Ontario. You want to run a 10k? Mark: I lift heavy stuff. I’m not a runner. Mark ended up running a solid sub-hour 10k. He was very happy, but knew it was only a diversion for him. He’s got other goals. 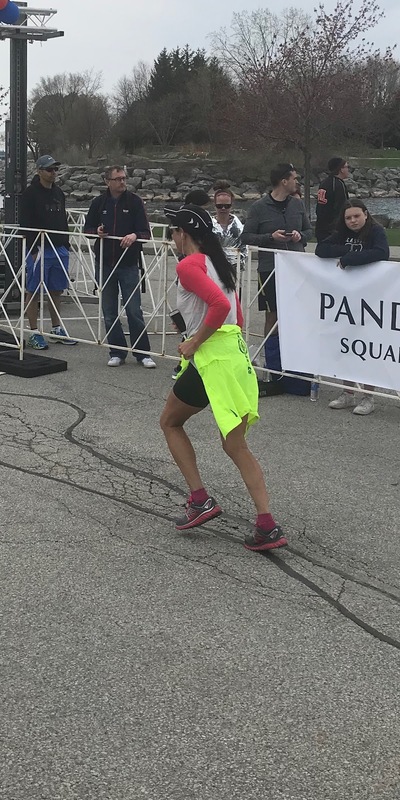 I ran a solid marathon, and couldn’t have been happier with my performance. I ran nice even splits and just did what I do. I took in the scenery (which did NOT include clowns) and let my legs roll through the distance. When I finished, the announcer called out “That’s Eva Basehart. She’s a marathoner extraordinaire”. Mark even made me a Tigger sign. I truly was running happy. Driving home, I could not help but count my running blessings. I fell asleep in the car with true happiness on my mind. There were thoughts of what is to be and what has already been. I thought about how lucky I am to be part of such a beautiful sport and to have my hands on the pulse of it. Even in my sleep, I was very excited to get going on my next adventure and happy that I had this challenge, that I took on with gusto! If you’ve read my blog, you know that I’ve thought of stepping away from running from time to time, Those thoughts are gone. That was only a hairline crack in the armor and that hair is gone. 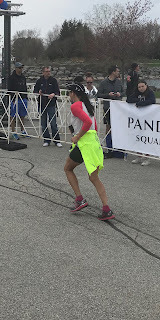 So, the others in my home may find their happy lifting heavy stuff, taking yoga or biking, but as for me, I’m going to keep running, And, you can be dang sure, I’m going to Run Happy!